Our habits can have either productive or unproductive results. In this episode we talk about how habits are formed, and how we can mold them to give us the results we want. It's not too soon to think about how you're going to start 2017. Kick off the new year with a group of motivated women like you, in one of my paid The Productive Woman Mastermind groups. If you’re looking for encouragement, motivation, and accountability in achieving your goals and moving forward in a life that matters, you'll find it there. TPW Mastermind groups are small, to allow maximum participation and benefit. New groups will start after the first of the year, but the groups are being formed in November and December, and spaces are limited, so get on the list now–visit the Work with Me page on the website for information and a link to the short online application. Questions? Email me! Are your habits helping you make a life that matters? I've been thinking a lot about mindset and how it affects our lives. Continuing on the “Mindset Matters” theme from Episode 108 (Productive Attitudes) and Episode 112 (Productive Beliefs), this time we're looking at our habits–both of action and of thought–and how they either help or hinder our productivity. 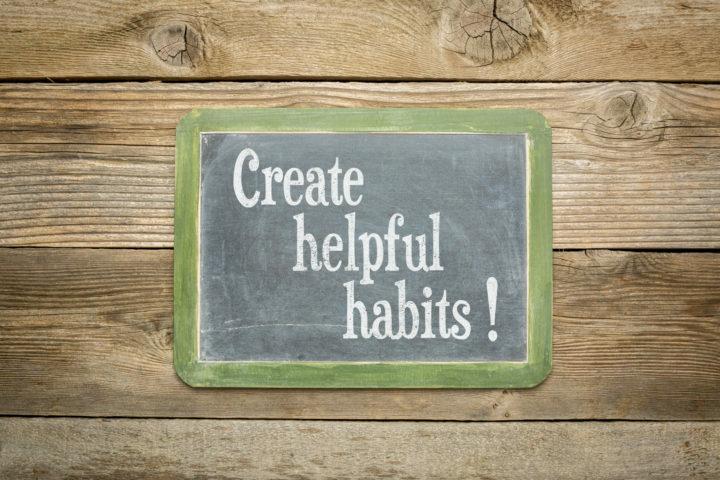 What is a habit, and how does this relate to mindset matters? What we present to the world is found in our habits and repeated behaviors. While what we accomplish doesn’t define us, who we are is very much found in those things that we repeatedly do. Our thoughts create our feelings, and our feelings motivate our actions. Our thoughts and ways of thinking and feeling can become habitual. Our habits are automatic behaviors that bypass our conscious thought and they can help us achieve our goals, or they can undermine our goals. “Habits …. emerge because the brain is constantly looking for ways to save effort. Left to its own devices, the brain will try to make almost any routine into a habit, because habits allow our minds to ramp down more often. This effort-saving instinct is a huge advantage. An efficient brain requires less room, which makes for a smaller head, which makes childbirth easier, and therefore causes fewer infant and mother deaths.” (The Power of Habit, pg. 17). This means that if we're pursuing a goal that contradicts a deeply ingrained habit, we have to work harder. According to Duhigg, habits are activated and controlled by a primitive part of the brain called the basal ganglia. When it is working, and we are on auto-pilot, the more sophisticated parts of our brain, which control higher and more complex levels of thinking, aren’t working. For example, when we are driving we often change lanes and turn the change the signal without thinking too much about it. The basal ganglia takes over and leaves the higher part of our brain free to have a conversation with someone else in the car. Duhigg also introduces an idea called “habit loops.” He wrote, “First there is a cue, a trigger that tells your brain to go into automatic mode and which habit to use. Then there is a routine, which can be physical or mental or emotional. Finally, there is a reward, which helps your brain figure out if this particular loop is worth remembering for the future. Over time, this loop — cue, routine, reward; cue, routine, reward — becomes more and more automatic. The cue and reward become intertwined until a powerful sense of anticipation and craving emerges” (The Power of Habit, pg. 19). When our brain goes into a loop, it associates the reward with the routine. He continues, “When a habit emerges, the brain stops fully participating in decision-making. It stops working so hard, or diverts focus to other tasks. So unless you deliberately fight a habit — unless you find new routines — the pattern will unfold automatically” (The Power of Habit, pg. 20). I highly recommend you read (or listen to the audio version of) The Power of Habit to gain a stronger understanding of what a habit is, how habits are formed, and what impact our habits–good and bad–have on our ability to make a life that matters. How can we change a “bad” habit? Truthfully, most habits aren't intrinsically good or bad. A habit can only be evaluated in terms of its outcome–whether you like the result or not. So if you don’t like the results or consequences of a habit, how can you change it? Willpower alone isn’t enough. We often tell ourselves we’re not going to take a particular action anymore, but our willpower will only take us so far. On the other hand, willpower is a skill that can be developed, like a muscle can be strengthened through purposeful practice. Willpower itself can become a habit. Most of us struggle with exercising willpower by saying, “I’m not going to do this thing anymore.” If we understand the concept of the “habit loop” that Duhigg talks about, the better approach is to interrupt that loop. Change the cue, change the routine or response to the cue, and/or establish a new reward for the new behavior you want to make habitual. The key, though, is to do it intentionally. And as part of the process of creating a new habit, identify what obstacles you might come up against and have a plan in place to deal with them. It's important to have a system in place to capture your appointments, ideas, and tasks. Have a plan in place — whether it is a notepad always with you, a calendar on your phone, or an app to record notes. Using the “habit loop” idea to create a new habit, you break the process down. For example, perhaps the trigger is you agree to a lunch date with a friend. The routine (or action) would be to write it down in your calendar and perhaps set a digital alarm. The reward is that you won’t forget the important commitment. Planning ahead for activities will help you to know if you have all the necessary materials, and to know when the deadline is. A simple planning ahead habit is to take a moment before you end your work day to write down the three most important things (or even just one) you need to get done the next day on a piece of paper or in an app. This sets you up to start the next day well, already knowing what you're going to do and confident you're prepared because you've taken a moment to think it through. Have you read the book, Eat that Frog? The author, Brian Tracy, talks about doing the “worst” thing first. If you create a habit of doing the “worst” (i.e., most important, most challenging, most daunting) task first thing, you have set a successful tone for your day. Marie Forleo says to “create before you consume.” In other words, do your key task before checking email, social media, watching tv, etc. 4. Create white space and margin in your life. White space in your schedule might result from creating a habit of leaving space between appointments, instead of scheduling appointments back to back. Creating white space can also mean weeding out your belongings, and minimizing the stuff you have. Studies on the stressful impact of clutter show it can actually impact our emotional and physical well being. According to these studies, women who live in a cluttered environment have higher levels of cortisol, which increases the risk of anxiety, digestive problems, heart disease, and weight gain. Consider a trigger and a reward for de-cluttering your space. Developing a series of habits in creating physical and mental margin in your life can boost your productivity in every way that matters. When you create routines that become habitual, those activities move from the higher part of your brain to your basal ganglia, making them more automatic and leaving more brain space for more important tasks. Daily routines can help you create a more emotionally and physiologically healthy environment. Check out Mike Vardy’s work on establishing themes for your days; any time you batch similar kinds of work you save mental energy, as it takes time for your brain to switch between tasks. For example, consider the efficiency of batching your errands on a single day, rather than interrupting multiple days to run out for individual errands. A weekly review is a great routine to help you plan the landscape of your life, by reviewing your calendar and weekly tasks. If you do this on the same day each week, it becomes a habit. Similarly, establish monthly routines, such as paying bills or completing certain household tasks or business reports, and annual routines, such as always scheduling your annual physical and dental checkup during your birthday month. Look at the things that you do each day, each month, and each year to see where patterns emerge. Build routines that with regular practice become habits, leaving the creative part of your brain to think about other things. Remember to include routines for self-care, including time for sleep, exercise, and for drinking plenty of water. Schedule time for your own learning and personal growth, such as a book you’d like to read. When your best-laid plans fall apart because life intervenes, then what? Duhigg tells us that habits are “powerful, but delicate,” which means that they become automatic but can be disrupted by changes in our routine, like going on vacation. This means that we can turn the interruption into a “productive pause” that we can use to assess what we’re doing and whether we’re on the right track. In other words, since we know that “life happens” and interrupts our plans, we should plan ahead for those interruptions and obstacles. Know they're coming, think ahead, and have a plan in place to deal with those challenges. Living a meaningfully productive life requires us to adjust as life happens, and to extend grace to ourselves. Be kind enough to yourself to allow the space you need to adjust and get back on track. What habits help you stay productive and at peace? What strategies do you have in place to address and change those habits that don't serve you? Please share your thoughts in the comment section below or post in the Facebook group–or email me. Your input really matters to me.